WISCONSIN RAPIDS – Mid-State Technical College’s Phi Theta Kappa Honor Society (PTK) chapter, Beta Chi Theta, took first place out of 25 chapters in the Wisconsin Region for its Honors in Action (HIA) project and was named third most distinguished chapter in the state. The awards were announced at the PTK regional conference held in Wausau, March 9–10, where Beta Chi Theta also achieved Five-Star Status for its work to recognize academic excellence, organize leadership structures in the chapter, develop and submit the HIA and College projects and be active at the regional and international levels. “Our chapter is just two years old, so it’s truly an honor to be acknowledged in this way by Phi Theta Kappa International,” said Jill Quinn, Mid-State communications instructor and chapter co-advisor. “PTK sets the bar high and the projects are rigorous. We’re happy to see our students’ hard work recognized,” she added. Mid-State’s first-place HIA project applied research from the Eisner Foundation that suggests communities hold inter-generational “speak-outs” or panel discussions. The College’s PTK chapter hosted an inter-generational panel discussion titled "More Tech: Less Talk" on the Stevens Point Campus last December, bringing together experts in the community to discuss how modern technologies have affected communication and how we can bridge the gap between older adults and youth. According to Quinn, recognition for the awards is owed to the contributions of Beta Chi Theta’s student members. IT Software Developer alum and current Digital Marketing student Dwayne Corry, Nekoosa, conducted research for the HIA project with other chapter members but “single-handedly compiled the research, wrote the project and spearheaded the panel discussion necessary to complete the submission,” she said. Tracy Van Meter of Nekoosa, Urban Forestry student, was pivotal in researching and submitting the first phase of the chapter’s work on the College Project, which focused on the early stages of developing a college mascot. PTK Honor Society is the international honor society of two-year colleges and academic programs as well as associate degree-granting programs offered by four-year colleges. PTK recognizes and encourages scholarship by providing an opportunity for leadership and service, an intellectual climate for exchange of ideas and ideals and a stimulation of interest in continuing academic excellence. Learn more about Mid-State’s PTK chapter at mstc.edu/clubs. Dwayne Corry, Mid-State Technical College Digital Marketing student and active member of the College’s PTK chapter, proudly displays the Phi Theta Kappa Honor Society (PTK) Honors in Action project first-place award at the PTK regional conference in Wausau. 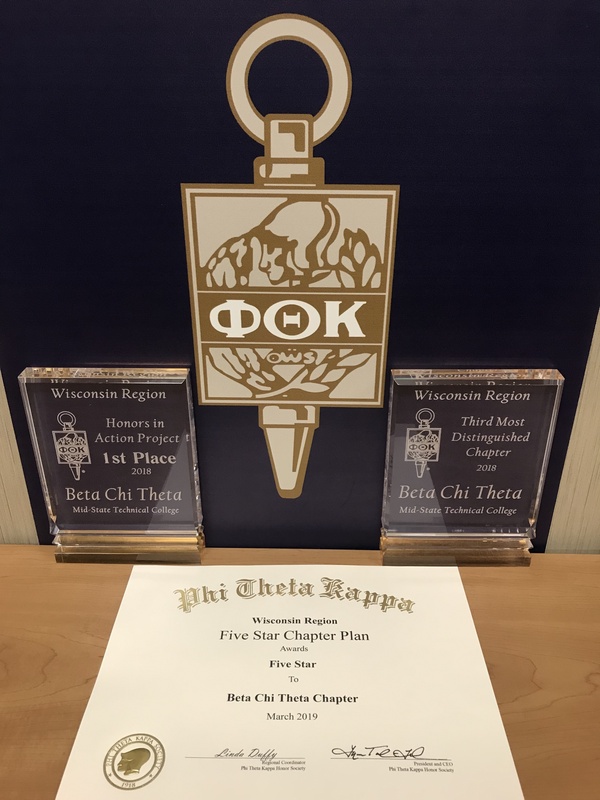 Mid-State’s PTK Honor Society chapter, Beta Chi Theta, was awarded first place in the Wisconsin Region for its Honors in Action project as well as third most distinguished chapter in the state and Five Star Status. The three honors were announced at PTK’s regional conference held in Wausau, March 9–10.